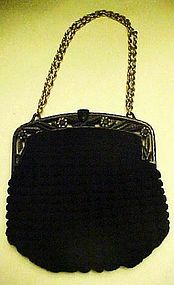 This 1920's - 1930's ladies purse is made of heavy hand-crocheted black rayon twill thread. Crocheted in a shell pattern. The little bag is in perfect condition. The frame is black plastic with an Art Deco design and a hinged flip over clasp. The gold metal chain is 36" long, and can be worn on the shoulder or doubled for a shorter handle. The inside is black rayon moire, hand-stitched to the frame. 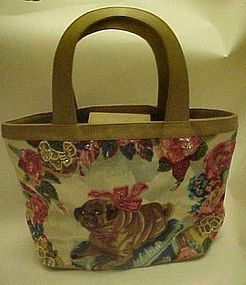 The frame is marked "Made in U.S.A." The purse is 7 1/4" high and 7 1/2" wide. Vintage Pierre Cardin mens steerhide leather belt 36"
Pierre Cardin glazed steerhide belt, size 36. This like new medium brown Pierre Cardin belt is made of glazed steerhide with lining of leather cowhide. 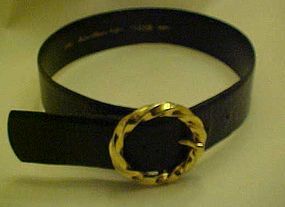 The metal buckle is gold-tone and was made in Italy. 39" long (plus buckle) 1 1/8" wide. First hole 36", last hole 32".Buy with confidence, as this is almost new with no flaws or scratches. 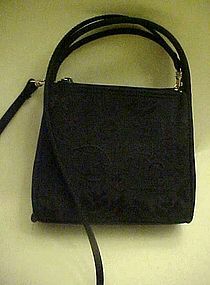 A sweet little black purse with machine black on black embroidery front. 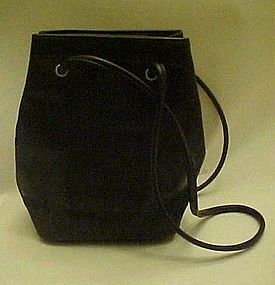 Use as a handbag, or snap on the long strap and use as a shoulder bag. Three roomy compartments. Center snaps closed and the two top sides have zippers. Black fabric lining. Appears to never been used, and is so nice and versitile. Measures 6 1/2" tall and 7 1/2 wide at the widest part. 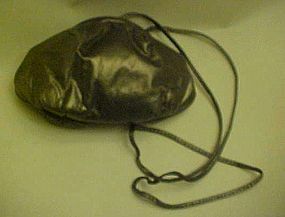 Adorable puffy soft leather purse with a metallic pewter bronze color. 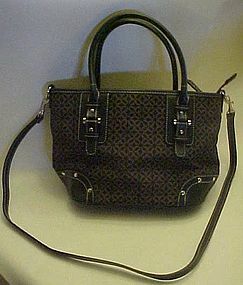 Long shoulder strap, fabric lining, and spring closure. Measures 6" tall and is 9" long. No makers name but made nicely. Excellent condition. Nice purse made by Relic. All original sewn label and registration number. made of faux leather and canvas print. Buckles, studs, and hardware of silver tone chrome on the straps and decoration. 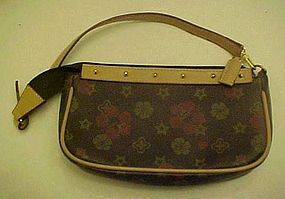 Removeable extra long strap to convert to a shoulder bag. Cloth lining with three sections.Middle section zips closed. 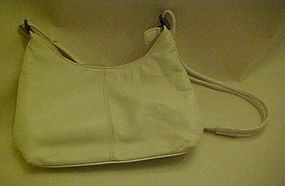 One inside zippered pocket, and a pouch for your cell phone. Xtra nice condition. no soils or flaws. Measures 8" tall and is 12" long. 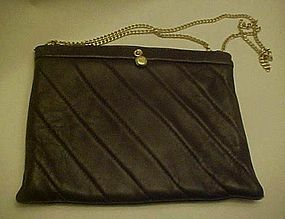 This is a wonderful shoulder bag purse by MAXX of New York. 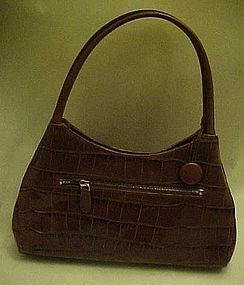 Great shiny brown crocodile leather with long handles. Maybe alligator. 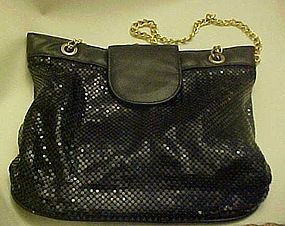 Embellished with front brass buckles. Zipper closure. Hot pink satin lining with inner side zipper pocket, cell phone pocket, 3 pen pouches,and a pda pocket. Gently if ever used. Measures 14 1/2" long and is 6 1/2" tall. 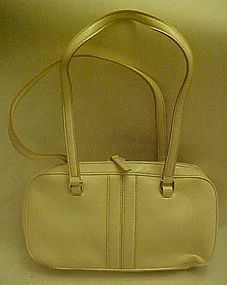 Nine & Company white patent leather purse, Spring!! Just in time for Spring, this cute white patent leather hand bag will fill the bill and go with most of your spring and summer outfits. 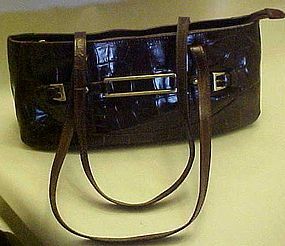 Made by Nine & Company, it features soft patent leather with white stitching. Double nylon zipper and double handles. 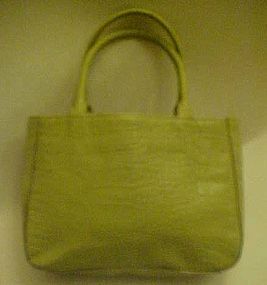 Nylon lining with zippered side compartment and two inner side pockets. No soiling or wear. Measures 6" tall 10" long and is 2" deep. Older but unused, and has been stored. Marked inside and out, Nine & Company. 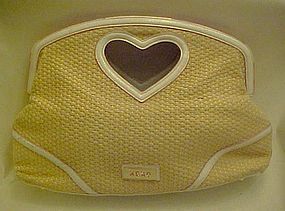 This sweet little purse has never been used. Leather (I think) with printed florals. Tan trim and removeable strap. You can use with handle or as a clutch. Silver stud decoration on upper trim. Black vinyl lining with one inside zipper pocket. Measures 5 1/2x 9 1/2" long and 2" deep. Nylon sipper closure. No name brand.